Time to review what the Russian Armed Forces say they got during the last year. One can’t confirm what weapons and equipment were delivered, so Russian claims have to suffice. This information appeared in Sergey Shoygu’s speech to the MOD Collegium on December 22 found here. TASS recapped the speech later that day. And Krasnaya zvezda dutifully recounted some of it on December 27. 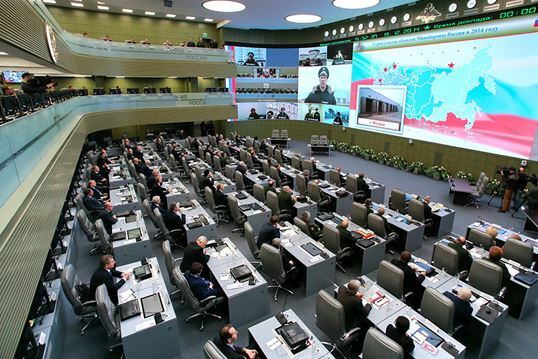 Overall, Defense Minister Shoygu reported that state defense order (GOZ) deliveries increased five percent over 2015. Beyond what the Russian military procured, Shoygu had interesting remarks on other issues. They are grouped more coherently below than in the original, to preserve the reader’s patience. Shoygu announced that Russia’s “combat possibilities” increased 14 percent in 2016. From what to what, he didn’t say. “Combat possibilities” is a Russian measure of how forces are equipped, divided by other key factors like manning, readiness, training, and morale. Navy up to 47 percent. Aerospace Forces (VKS) up to 66 percent. Ground Troops — 42 percent. Airborne Troops — 47 percent. Arms and equipment in “permanent readiness” units are 58 percent modern, according to the defense minister. The in-service rate of equipment in these units is 94 percent (up 5 percent from 2015). Serviceability of VKS aircraft is 62 percent. According to Shoygu, the armed forces are manned at 93 percent of their authorized strength, and 384,000 contractees are in the ranks. The NCO ranks are fully professional for the first time. Apparently, the military no longer relies on conscripts hastily turned into sergeants. New equipment allowed for force structure expansion in the Ground and Airborne Troops. According to TASS, Shoygu reported that nine new formations, including four motorized rifle and one tank division, appeared in the former. In the latter, three reconnaissance battalions, six tank companies, and EW and UAV companies were established. In 2016, the Russian Navy received 24 ships and support vessels, and the Proyekt 636.3 diesel-electric submarines Velikiy Novgorod and Kolpino for the Black Sea Fleet. The surface vessels included a Proyekt 22870 rescue ship, a Proyekt 19920 hydrographic ship, Proyekt 11356 frigates Admiral Grigorovich and Admiral Essen, and Proyekt 12700 mine countermeasures ship Aleksandr Obukhov. The Navy acquired 100 Kalibr (SS-N-27 / Sizzler) and Oniks (SS-N-26 / Strobile) cruise missiles. These missiles are carried on new Proyekt 636.3 subs and Proyekt 11356 frigates. In early December, logistics chief Army General Dmitriy Bulgakov said 19 of the 24 ships delivered were auxiliaries. And Admiral Essen fouled its screws while mooring before departing for its Black Sea homeport. The third Proyekt 11356 Admiral Makarov did not reach the fleet, nor did the first Proyekt 22350 Admiral Gorshkov frigate, or the initial Proyekt 11711 LSD Ivan Gren. Another less than impressive year of naval construction. 139 aircraft, including Su-35S fighters and ten Yak-130 trainers. Eight Su-30SM fighters went to Crimea, two to Rostov-na-Donu, and others to the Northern and Baltic Fleet. Unspecified numbers of new Mi-28N, Ka-52, Mi-35M, Mi-26, Mi-8AMTSh-VA, and Mi-8MTV-5 helicopters. 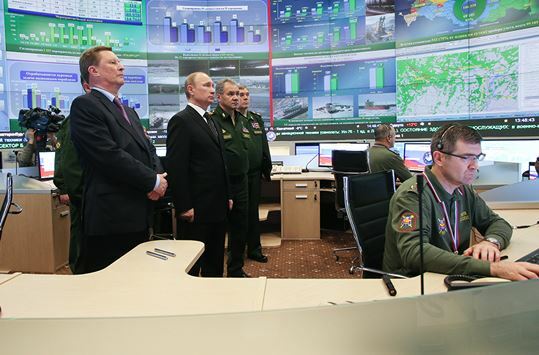 Four regimental sets of S-400 SAMs, 25 Pantsir-S gun-missile systems, and 74 radars. Two modernized Tu-160M and two modernized Tu-95MS strategic bombers. The Ground Troops reportedly received 2,930 new or modernized systems allowing for two missile brigades, two SAM brigades and two SAM regiments, one Spetsnaz brigade, 12 motorized rifle and tank battalions, and three artillery battalions to be reequipped. Besides two brigade sets of Iskander-M, they obtained 60 Tornado-G MRLs, 70 modernized Grad-M MRLs, and 20 Msta-SM SP howitzers. They acquired 22,000 communications systems bringing that equipment to 49 percent modern. More than 100 BTR-82AM joined Western MD forces. They also received ten new EW systems. The armed forces procured 105 systems with 260 UAVs. These included more than ten new Orlan-10 and Eleron-3 UAVs. They formed 36 units and subunits. The Russian military now operates 600 systems with 2,000 UAVs, compared with only 180 old systems in 2011. The Russian airborne got 188 new or modernized vehicles, including 60 BMD-4M and BTR-MDM, 35 BTR-82A, 40 modernized BREM-D, 2S9-1M SP mortars, and more than 6,000 D-10 and Arbalet-2 parachutes. At his final MOD teleconference of the year, the defense minister said 764 armored vehicles and 88 artillery systems of all types were acquired in 2016. Russia’s strategic missile troops placed four RS-24 Yars (SS-27 Mod 2 or SS-29?) ICBM regiments on combat duty in 2016, according to Shoygu. RVSN Commander General-Colonel Karakayev earlier said 23 Yars mobile and silo-based missiles were put into service. The defense minister said the armed forces got a total of 41 new (intercontinental-range) ballistic missiles (presumably both land- and sea-launched), bringing Russia’s strategic nuclear triad to 60 percent modern. The balance — 18 missiles — could be Bulava SLBMs. They might be for Borey-class SSBN hull four Knyaz Vladimir, along with a couple spares for practice launches. P.S. TASS added that, in 2016, the Southern MD got 350 pieces of armor, other vehicles, missiles, artillery, communications, EW, engineering, and special equipment items. Crimea in particular was reinforced with the S-400, Pantsir-S, Su-30SM, and Bastion (SSC-5 / Stooge) coastal missile launchers, which fire Oniks (SS-N-26 / Strobile) cruise missiles. Soon Defense Minister Sergey Shoygu will convene a year-end MOD Collegium to summarize the results of 2016, including procurement. A preview of Shoygu’s claims about Russian military acquisition in 2016 is evident in year-end reports from individual military districts. In late November, according to RIA Novosti, the Western MD announced that more than 1,500 pieces of equipment entered its inventory in 2016. They include Su-35S fighters, Mi-28N, Mi-35M, and Mi-8AMTSh helicopters, BMP-3 and BTR-82A armored vehicles, and Tigr-M and Tayfun vehicles. In early December, the district’s press-service said its forces will receive 500 major equipment items before the end of the month, including 20 T-72B3 tanks, An-148 transports, Mi-35M and Mi-8MTV-5 helicopters, and 30 command-staff vehicles. Russian defense industry retains the Soviet tradition of “storming,” or last-minute rush work to meet the annual production plan. You might not want a ride on a Russian helo assembled in December. On December 1, the Eastern MD reported it has received more than 650 major pieces of equipment this year. Interfaks-AVN indicated they include Su-35S and Su-34 aircraft, Iskander-M and Bastion SSMs, Tor, Pantsir-S, and Verba air defense systems, Tornado-G MRLs, and UAVs. The Central MD got more than 700 equipment items in 2016, according to TASS. It received the Iskander-M, Pantsir-S, eight aircraft, three updated Mi-24 helicopters, and 50 T-72B3 tanks. The Russian media hasn’t reported on Southern MD acquisition, but, being a high priority, it will likely equal the Western MD’s 2,000 items of equipment. Logistics tsar Deputy Defense Minister Dmitriy Bulgakov told Izvestiya the military has put more than 6,000 pieces of armor and other vehicles, and 1,000 missile and artillery systems into service this year. The latter includes “13 brigade and battalion sets” of SSMs and SAMs. He also noted that 19 auxiliary vessels have been commissioned into the navy. Bulgakov concluded, with this year’s deliveries, it’s “possible to say that half our armament is new.” That’s 50 percent on the way to the goal of 70 percent by 2020. The lists provided by the Russian media weren’t meant to be exhaustive. We’ll see a more complete enumeration of 2016 procurement from Shoygu or his deputies in the days to come. But even if we only consider Bulgakov’s 7,000 pieces of equipment, 2016 will be a bigger procurement year than 2014 when President Putin stated that 4,500 weapon systems and other items were acquired. On Topwar.ru on 15 September, Aleksandr Staver and Roman Skomorokhov asked whether President Vladimir Putin, like his predecessor Stalin, has decided to curb (at least temporarily) his key program. Today it’s rearmament rather than collectivization. The authors assess the program and its problems from a conservative viewpoint. They assert the arms program is not being fulfilled and the MOD budget is being cut (whether admitted or not). In particular, they contend, it is new weapons programs that are suffering, so they argue for cheaper modernization of existing armaments. Debate over rearmament is a constant. Staver and Skomorokhov don’t even mention that the start of the next arms program was delayed, or that the MOD and Finance Ministry are far apart on funding it. For his part, Putin routinely says the current GPV will not be cut, and the armed forces will have 70 percent modern arms and equipment in 2020. But 70 percent, according to the authors of this op-ed, is not enough. More is needed. Then they turn to corruption. They allege that the ones who are “dizzy with the success” of the arms program are the ones who are stealing from it. They say a return to 1937 would put an end to this, and to other problems with rearmament. Recall that even Putin and United Russia once talked about bringing treason charges for non-fulfillment of the GOZ, but nothing came of it. Interesting item on wages in Russia’s defense industrial sector in NG on November 11. Alina Terekhova reports average monthly pay in the OPK is 17 percent higher than the country as a whole. However, defense industry salaries lag employee earnings in other key sectors (i.e. railroads, oil, finance). Yet they are likely to grow while wages elsewhere will probably begin to fall. Minpromtorg [rather optimistically] forecasts that the earnings of OPK workers will double over the coming five years. Defense industry pay grew 13 percent last year [not entirely consistent with the table below] against almost 12 percent in other areas. Earlier this year, workers in Russia’s mining industry made nearly 57,000 rubles per month, oil workers 83,000, railroads 41,000, and finance 67,000. Pay in the defense industries averaged about 38,000 rubles per month during the first half of 2014, according to Rosstat. Nationwide it was about 32,000. That 38,000 seems to fit in the context of other salaries (e.g. 30-35,000 for junior officers and contractees). Rising inflation, Terekhova reports, could reduce real earnings for everyone next year. She quotes a couple experts, neither of whom expects a decline in OPK wages. Despite the stagnation evident in the economy, the Kremlin will likely continue funding the GOZ generously given increased tensions with the West. This will keep upward pressure on defense sector salaries. It’s interesting that the oft-mentioned “cadre famine” in defense industry hasn’t bid wages higher. But some enterprises report the average age (and presumably the pay grade) of their workers is dropping with the arrival of new and younger employees.